VoiceThread in Palm Beach County? Comments Off on VoiceThread in Palm Beach County? This week our department had the pleasure of meeting with the gentlemen who developed EdVoiceThread. They are geniuses (and extremely personable – go figure) and have absolutely thought of everything when it comes to developing a product for K-12 and higher education, that is safe, secure, reasonably priced and has the potential for huge impact on learning and global collaboration. How nice it would be to bring something so powerful and easy to our school district! If YOU haven’t heard of Ed VoiceThread, you are missing one of the most remarkable FREE 21st Century online learning applications that you can be using today! You must check out these examples ! 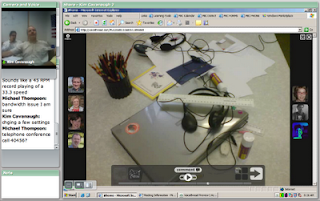 Anyone can create a VoiceThread by adding a piece of media ( JPEG, GIF, BMP, PNG, PPT, PPS, PDF, DOC, XLS and a variety of video types) and then allow others to make comments in any of 5 different ways – using voice (with a microphone or telephone), text, audio file, or video (with a webcam) – and share them with anyone they wish. Allowing group conversations to be collected and shared in one place, from anywhere in the world. The beauty of VoiceThread is that it’s simple and safe! Here is one I created that I use as a demo. You’ll see a DE Streaming video segment and some video, audio and text comments. You can let it play or click on the avatars to activate the demo student comments. There are also some other comments that have been added by real teachers as I’ve used this to demonstrate this in workshops. I’ve since learned however, that the way I’ve been recommending that teachers use it is not a best practice at all. In the recording below, you’ll hear me tell you that I set up one account and let my students create their own profiles under my account. Then they sit at a computer in my classroom and contribute to the VoiceThread. Although this would certainly work, especially in a K or 1st grade classroom with supervision, the problem would be that in an instant a student could accidentally delete the entire VoiceThread. They also mentioned a feature that is coming soon is the ability to CLONE a VoiceThread. Once you’ve spent time creating a VoiceThread that might be complex, it would be pretty nice to be able to clone it to customize it for another use later on. Please leave a comment about how you might use VoiceThread in your classroom or any barriers you foresee to a successful implementation. I hope you’ll also leave a voice comment on the VoiceThread here.